When your beer supply starts to get low, you have to take drastic measures. 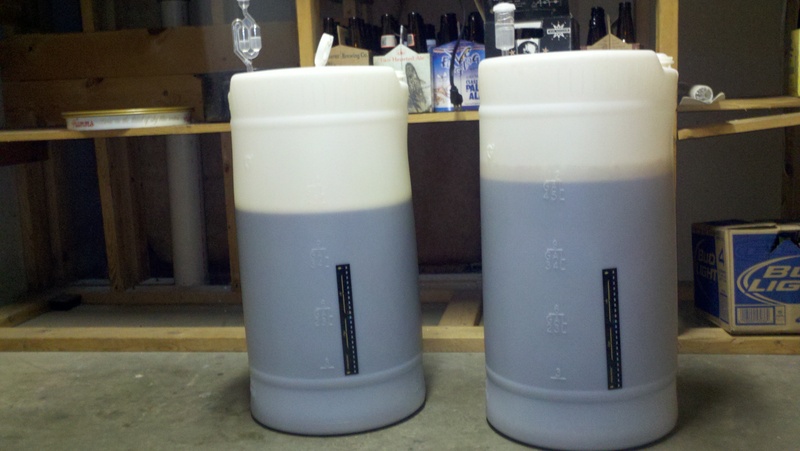 Over the course of the weekend, I brewed a robust porter and a biere de garde. The result: two fermenters happily bubbling away as 23 gallons of wort becomes beer! Brewing on back to back days allows certain things to happen and my second brew day ran much more smoothly. My mash tun was already out in the garage, my burner and propane were all set up and ready to go, all the gear I usually have to lug from the basement to the garage skirt was already in my brewing area. All I had to do was get my grain weighed and crushed, carry my water out and fire up the burner. Having all that stuff set up didn’t really shorten my second brew day much. Rather than carrying stuff up to my brewing area, I had to clean and store my gear. The end result being not much time savings on day two. However, the combined time for the two brew days was much lower than the time for two brew days separated by weeks, when I would have to duplicate the setup time and the cleanup time for two distinct brew days. So, what are the benefits of back to back brew days besides some minor time savings? I think the main benefit is knowledge. When brewing on a day all by itself, I worry about remembering everything to try to make the day as efficient as possible. The second day, I was really able to think about my process. I just added a weldless ball valve to my kettle, which is awesome. I am so lucky I hadn’t burned myself. However, my water temp going into the mash tun was much lower because it took a few minutes to run the liquid through a half-inch tube rather than just dumping the kettle into the tun. My second brew day I realized I could just raise the temp of my strike water, transfer to the mash tun and wait for the water temp to drop to my targeted temp. It’s something obvious, but when I’m in the heat of set up and trying to stay focused, I don’t always think of obvious solutions. When you can, I think scheduling back-to-back brew days would be great to learn more about your brewing process. In the comments, let me know what you’ve learned from doing brews close together.